We endorse the decisive evidence that markets and economies are complex, dynamic systems which are not reducible to normal cause-effect analysis. However, we are willing to acknowledge the likelihood that the future is likely to rhyme with the past. Thus, we believe there is substantial value in applying simple statistical models to discover average estimates of what the future may hold over meaningful investment horizons (10+ years), while acknowledging the wide range of possibilities that exist around these averages. To be crystal clear, the commentary below makes no assertions about whether markets will carry on higher from current levels. Expensive markets can get much more expensive in the intermediate term, and investors need look no further back than the late 2000s for just such an example. However, the physics of investing in expensive markets is that, at some point in the future, perhaps years from now, the market has a very high probability of trading back below current prices; perhaps far below. More importantly, investors must recognize that buying stocks at very expensive valuations will necessarily lead to future returns over the subsequent 10 – 20 years that are far below average. John Hussman at Hussman funds is careful to qualify the value of this analysis: “Rich valuation is strongly associated with weak subsequent returns, but only reliably so over periods of 7-10 years. In contrast, the present syndrome of overvalued, overbought, overbullish, rising-yield conditions is typically associated with abrupt and often steep losses, but is more commonly resolved over a period of months rather than years.” (Hussman, Feb 2013). This forecast is also supported by evidence from an analysis of corporate profit margins. In a recent article, John Hussman published a long-term chart of U.S. corporate profits, which demonstrated the magnitude of upward distortion endemic in current corporate profits, which we have reproduced in Chart 1 below. Companies have clearly been benefitting from a period of extraordinary profitability. The purpose of our analysis was to examine several methods of capturing market valuation to determine which methods were more or less efficacious. Furthermore, we were interested in how to best integrate our valuation metrics into a coherent statistical framework that would provide us with the best estimate of future returns. Our approach relies on a common statistical technique called linear regression, which takes as inputs the valuation metrics we calculate from a variety of sources, and determines how sensitive actual future returns are to contemporaneous observations of each metric. Linear regression creates a linear function, which by definition can be described by a slope value and an intercept value, which we provide below for each metric and each forecast horizon. A further advantage of linear regression is that we can measure how confident we can be in the estimate provided by the analysis. The quantity we use to measure confidence in the estimates is called the R-Squared. The following matrices show the R-Squared ratio, regression slope, regression intercept, and current forecast returns based on a regression analysis for each valuation factor. The matrices are heat-mapped so that larger values are reddish, and small or negative values are blue-ish. Click on each image for a large version. Matrix 1. contains a few important observations. Notably, over periods of 10-20 years, the Q ratio, very long-term smoothed PE ratios, and market capitalization / GNP ratios are equally explanatory, with R-Squared ratios around 55%. The best estimate (perhaps tautologically given the derivation) is derived from the price residuals, which simply quantify how extended prices are above or below their long-term trend. The worst estimates are those derived from trailing 12-month PE ratios (PE1 in Matrix 1 above). Many analysts quote ‘Trailing 12-Months’ or TTM PE ratios for the market as a tool to assess whether markets are cheap or expensive. If you hear an analyst quoting the market’s PE ratio, odds are they are referring to this TTM number. Our analysis slightly modifies this measure by averaging the PE over the prior 12 months rather than using trailing cumulative earnings through the current month, but this change does not substantially alter the results. As it turns out, TTM (or PE1) Price/Earnings ratios offer the least information about subsequent returns relative to all of the other metrics in our sample. As a result, investors should be extremely skeptical of conclusions about market return prospects presented by analysts who justify their forecasts based on trailing 12-month ratios. Matrix 4. shows forecast future real returns over each time horizon, as calculated from the slopes and intercepts above, by using the most recent values for each valuation metric (through February 2013). For statistical reasons which are beyond the scope of this study, when we solve for future returns based on current monthly data, we utilize the rank in the equation for each metric, not the nominal value. For example, the 15-year return forecast based on the current Q-Ratio can be calculated by multiplying the current ordinal rank of the Q-Ratio (1171) by the slope from Matrix 2. at the intersection of ‘Q-Ratio’ and ’15-Year Rtns’ (-0.000086098), and then adding the intercept at the same intersection (0.119607) from Matrix 3. The result is 0.0188, or 1.88%, as you can see in Matrix 4. below at the same intersection (Q-Ratio | 15-Year Rtns). Finally, at the bottom of the above matrix we show the forecast returns over each future horizon based on our best-fit multiple regression from the factors above. From the matrix, note that the best forecast for future real equity returns integrating all available valuation metrics is 1% or less per year over horizons covering the next 5 to 20 years. We also provided the R-squared for each multiple regression underneath each forecast; you can see that at the 15-year forecast horizon, our regression explains 80% of total returns to stocks. 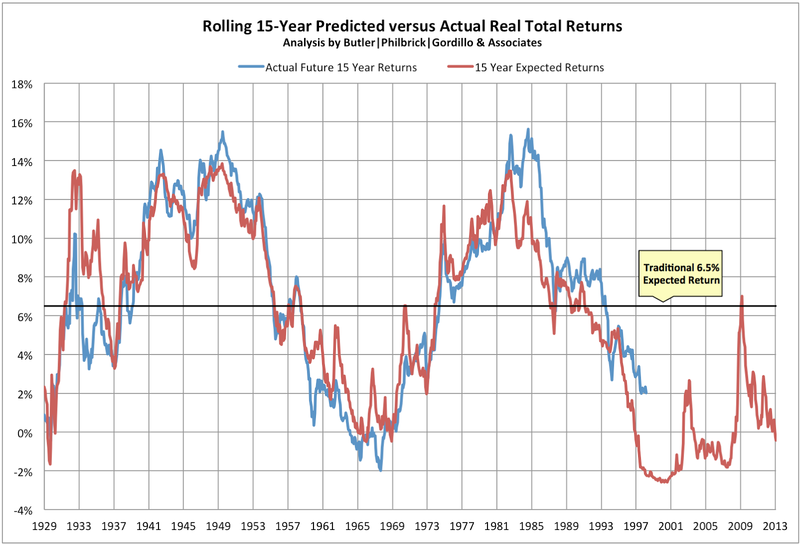 You can see that 15-year “Regression Forecast” returns are -0.43% per year using market valuations as of February 28, 2013. You can see we tested against periods during the Great Depression, the 1970s inflationary bear market, the 1982 bottom, and the middle of the 1990s technology bubble in 1995. The table also shows expected 15-year returns given market valuations at the 2009 bottom, and current levels. These are shaded green because we do not have 15-year future returns from these periods yet. Observe that, at the very bottom of the bear market in 2009, real total return forecasts never edged higher than 7%, which is only slightly above the long-term average return. This suggests that prices just approached fair value at the market’s bottom; they were nowhere near the level of cheapness that markets achieved at bottoms in 1932 or 1982. As of the end of February 2013, annualized future returns over the next 15 years are expected to be less than 0 percent. We compared the forecasts from our model with what would be expected from using just the long-term average real returns of 6.5% as a constant forecast, and demonstrated that always using the long-term average return as the future return estimate resulted in 350% more error than estimations from our multi-factor regression model over 15-year forecast horizons (1.22% annualized return error from our model vs 5.55% using the long-term average). Clearly the model offers substantially more insight into future return expectations than simple long-term averages, especially near valuation extremes. The ‘Regression Forecast’ return predictions along the bottom of Matrix 4. are robust predictions for future stock returns, as they account for over 100 different cuts of the data, using 4 distinct valuation techniques, and utilize the most explanatory statistical relationships. The models explain up to 82% of future returns based on R-Squared, and are statistically significant at p~0. Despite the model’s robustness over longer horizons, it is critical to note that even this model has very little explanatory power over horizons less than 6 or 7 years, so the model should not be used as a short-term market-timing tool. 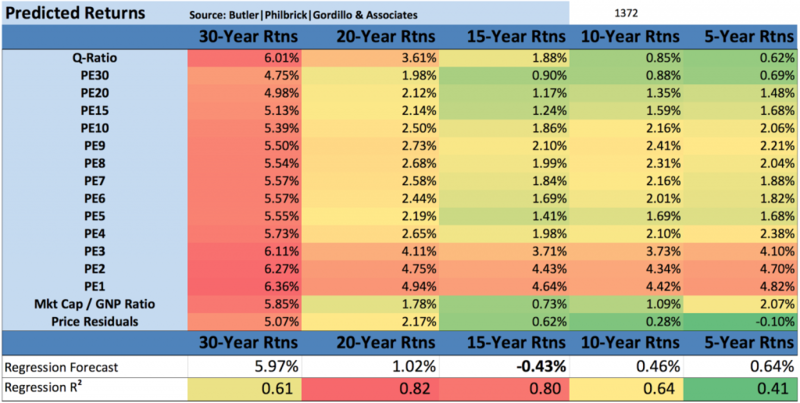 Returns in the reddish row labeled “PE1” in Matrix 4 were forecast using just the most recent 12 months of earnings data, and correlate strongly with common “Trailing 12-Month” PE ratios cited in the media. Matrix 1. demonstrates that this trailing 12 month measure is not worth very much as a measure for forecasting future returns over any horizon. However, the more constructive results from this metric probably helps to explain the general consensus among sell-side market strategists that markets will do just fine over coming years. Just remember that these analysts have no proven ability whatsoever to predict market returns (see here, here, and here). This reality probably has less to do with the analytical ability of most analysts, and more to do with the fact that most clients would choose to avoid investing in stocks altogether if they were told to expect negative real returns over the long-term from high valuations. Those investors who are determined to achieve long-term financial objectives should be heavily motivated to seek alternatives to traditional investment options given the grim prospects outlined above. Such investors may find solace in some of the approaches related to ‘tactical alpha’ that we have described in a variety of prior articles.